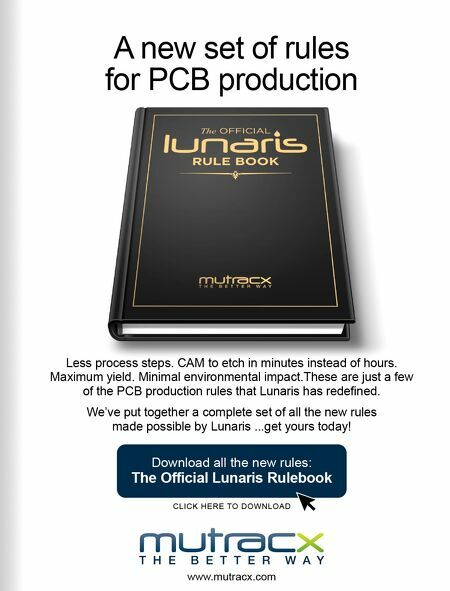 68 PCB007 MAGAZINE I AUGUST 2018 Introduction Copper foil used in the fabrication of print- ed circuit boards is subjected to a plurality of copper layer treatments, including a roughen- ing treatment followed by a locking or gilding treatment to form a matte surface on the cop- per foil. The matte surface is then coated with a thin layer of zinc and heated to produce a brass layer that provides the copper foil with sufficient bonding sites to enhance the inter- laminar bond strength between the resin and the copper foil. This brings me to a tale—a zinc "tail"—but what exactly is a zinc tail? Origin of the Zinc Tail An electrodeposited copper foil to be lami- nated on a substrate for a PCB is treated with either a brass or zinc coating. This barrier layer serves several purposes, including improving the adhesion of the foil to the laminate resin materials and acting as a diffusion barrier. How does this play into the creation of the zinc tail? The mechanism, while not well understood, is believed to have its origins after the use of plasma for desmear/etchback. In particular, the zinc tail is prominently visible if plasma provides a three-point connection (Figure 1). 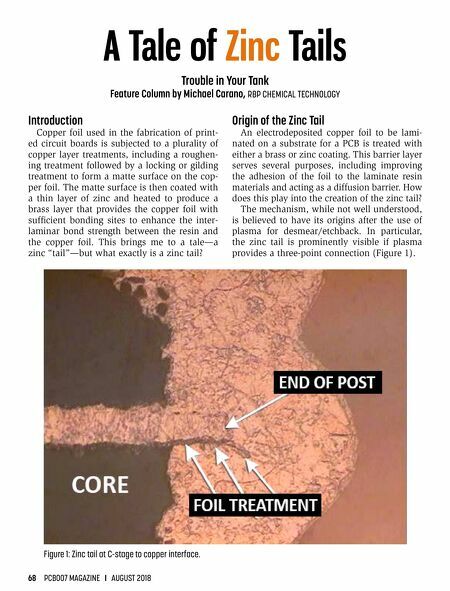 A Tale of Zinc Tails Trouble in Your Tank Feature Column by Michael Carano, RBP CHEMICAL TECHNOLOGY Figure 1: Zinc tail at C-stage to copper interface.